I arrived at my annual physical a few weeks late. My doctor sat me down, greeted me and then said goodbye. She remarked that she was sad that my kids would grow up without me but she was certain that I’d have a heart attack in a few months. She predicted that the ER would send me home and I’d die shortly after of an undiagnosed heart attack. All because I was working 80 hour weeks trying to earn the down payment to buy my kids a house. When 79% of lawyers believe that they must work outside of business hours to achieve success, that’s a real problem for our profession. According to the 2018 Legal Trends Report, 58% of lawyers believe that they must work outside business hours to be successful and 21% believe that working beyond scheduled business hours is ‘what lawyers do’. This belief, that I call ‘glorified toughness’ makes it almost impossible for a lawyer to balance personal and professional time. Nobody wants to be seen as a slacker. Lawyers believe we must work harder to be called a real lawyer. You feel the need to work longer and harder than anyone else. Why? Because other lawyers on Instagram and Facebook boast of how little sleep they got working on briefs or before going to trial. These comparisons lead to thoughts that make practicing law more stressful and toxic. The 2018 ABA Midyear Report suggests that 29% of lawyers struggle with depression. 19% suffer from anxiety. We are making ourselves unhappy and unwell and that has to change. Most lawyers would agree that increasing revenues is a large part of being successful. While many lawyers believe that working longer hours will bring them success, I believe there are other less health-threatening ways to do it. Let’s explore a few new ways to be successful without sacrificing your health, mental wellness or private time. Lawyers spend up to 48% of their time attracting and onboarding new clients. Solo and small firm lawyers generally like to qualify potential clients themselves, believing that they are the best judge of whether to accept the new clients. If you do your own intake, you have to spend other time, nights and weekends, to catch up on your client focused and other administrative work. That doesn’t work. One solution is to use a virtual receptionist to screen your calls and to qualify potential clients for you. A company like Smith.ai can provide you with live virtual receptionists who use your script to screen potential clients. Instead of talking to anyone who calls, you can choose to spend with only the most qualified potential clients. What’s really efficient is that Smith integrates with several email providers so you can automate adding new clients to your email list. As a lawyer, you are likely to be skeptical about allowing anyone else to help you in your legal work. Maybe you believe that the work has to be done by you to be correct. Or, that it will take longer to explain to a paralegal so it’s faster to do it yourself. Or, that you’re being virtuous and saving money by doing all the work yourself. Those faulty thoughts result in overwhelm and the need to work outside to business hours to get it all done. However, you can change that. 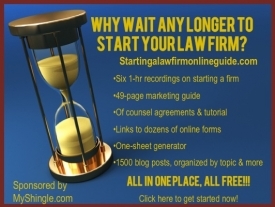 Outsource that work to a contract lawyer firm and save time and money. Legal work like drafting or legal research are perfect for outsourcing to a company like LawClerk.legal that enables you to find and hire vetted attorneys to work for you. Administrative tasks like bookkeeping are better done by qualified freelancers because it frees up your time for lawyering and reduces stress if you are ‘number phobic’. Hate collections? Who doesn’t, but you still have to get paid. Create a system to encourage clients to pay on time, then use the virtual assistants at Smith.ai to follow up on unpaid bills. A law practice is a business. Practicing law and running a business at the same time is overwhelming. The time you are devoting to understanding business models and finding the right one for your firm is better spent on income-generating activities like in-person networking and creating thought-leadership content that grow your client base. Get help. Instead of learning to manage your law business, hire an experienced business consultant to help you select the best options. Get a business coach who is focused on lawyers from Clarify.fm. Being smart can be an obstacle. Hard to believe, but true. Lawyers are smart people who, at times, lack common sense. That high intelligence also causes lawyers to overlook the contributions of others. Improving your emotional intelligence helps you understand your own strengths and weaknesses as well as recognize the talents of others. You seek less external validation when your emotional intelligence is high. You feel more confident in running your law practice the way you see fit. Take assessments to better understand your own emotional intelligence and how you interact in a group. You’ll find it easier to delegate and lead a team. Turns out that overwork is overrated. You can achieve great success and profitability in your law practice without sacrificing your time or health if you plan correctly.